Origami is the art of folding paper into a variety of things, so it's also called "paper folding". It can be simple or complicated, and the sky is the limit. In this post I'll introduce one way to make origami: I fold a small piece of paper into some shape, and make many of them and assemble them into something beautiful. Usually after I am done I give it to somebody as a gift, and usually his or her reaction involves crying and slobbering (haha not really..). It really warms the cockles of the recipient's heart. 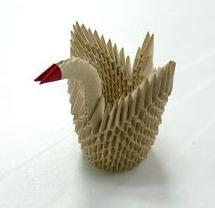 I'll give you origami instructions on how to make a beautiful origami swan like the one in the photo. Don't worry: it's easy origami paper folding and anyone can do it. Then I'll show you some work I've done. Let's go on and see how you can impress your loved ones with this beautiful work of paper. Without further ado let's get started on making a beautiful piece of art!